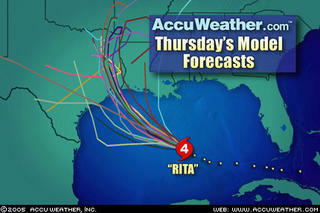 The computer models are still showing a more easterly landfall. That is good for us on the west side of Houston. I'm thinking of Jamie at Once Upon a Story. She lives out here too. Hope her family is tucked in and hunkered down. Camille, I hope that you and your family are riding out the pre-storm preparations okay and that the hurricane stays away from y'all. Aww, thanks, Camille! Yes, we sure did tuck in... although as hectic as it is to prepare for a hurricane (let alone fight the traffic and crowds scrambling to do the same), it sure felt less cozy than that in the days leading up to Rita. Even though today has been a lot more relaxed, I still feel like I'm moving and swaying, kind of like when you've been on a boat. I'm getting my non-hurricane-frenzy legs back, tee hee. It sounds like you guys stayed, too? I assume since you're back and posting that all is well; hope you managed to escape even minor damage or power outages though.